and Get Rid of Him? The Belo Records, 1842-2007 digital collection contains hundreds of items from the Belo Records archive held by SMU’s DeGolyer Library. Each item includes information about its relationship to Belo Corp.'s corporate and technological history. 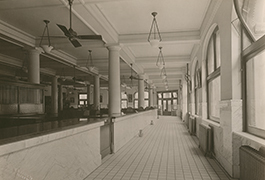 The Belo Records, 1842-2007 archive includes the business documents and artifacts preserved by the company’s leadership since its establishment in 1842. The corporate archive comprises operational documents of Belo Corporation and A.H. Belo Corporation, as well as records of its constituent properties: publishing companies, radio and television stations and online media, either founded or purchased by the Belo Corporation. Included are internal departmental annual reports, business correspondence, business and personal papers of Belo leaders, starting with members of the Belo family and continuing with G.B. Dealey and his successors, operational ledgers, documents related to the purchase of different publishing and media properties, bound newspapers and journals, anniversary mementos, and books by Belo employees. Also included are photographs spanning more than a century, visual and sound recordings, video and audio oral histories, and transcripts of interviews with Belo executives. The Belo Corporation was named after Colonel A.H. Belo in the late 1870s. Originally a newspaper publishing business located in Galveston, Texas, the company moved to Dallas, Texas in the 1880s and developed into a corporation consisting of printing and publishing enterprises, broadcasting stations and an online publishing company. Belo Corporation was renamed Belo Corp. in 2001. In 2008, the corporation split into two separate properties, A.H. Belo Corporation and Belo Corp. The company originated with the Daily News, a Galveston, Texas newspaper founded in 1842 by Samuel Bangs and continued by Wilbur F. Cherry and Michael Cronican, followed by Willard Richardson, then Col. Alfred Horatio Belo and ultimately G.B. Dealey and his heirs. Belo became Willard Richardson’s full partner in 1870, and the company was renamed Richardson, Belo & Co. Following Richardson’s death in 1875, Belo bought the remainder of the business and renamed it A.H. Belo & Co. in 1876. 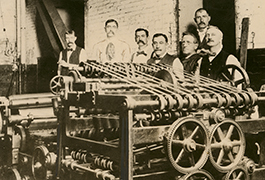 Under Belo’s direction and due to his investment in modern print presses, the newspaper flourished and the business became profitable. In addition to the Galveston Daily News, the company also continued to publish the Texas Almanac, founded by Richardson in 1857. In 1885, Belo appointed George Bannerman Dealey to establish The Dallas Morning News as a sister newspaper to the Galveston Daily News. Shortly thereafter, Belo and his family relocated to Dallas. A.H. Belo died on April 29, 1901, in Asheville, North Carolina. His son, Alfred Belo Jr. led the company from 1901 until his death in 1906. After 1906, G.B. Dealey managed the company on behalf of the Belo heirs. The Galveston Daily News was sold in 1923 to W.L. Moody & Co., and the company concentrated all resources on its Dallas operations. 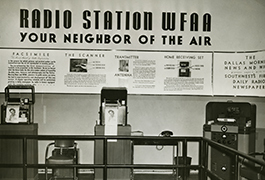 In 1922, WFAA, a radio service of The Dallas Morning News, and the first network radio station in Texas started broadcasting. In 1926, G.B. Dealey bought The Dallas Morning News, the Journal (the evening edition of The Dallas Morning News), the Semi-Weekly Farm News and the Texas Almanac from the Belo family and acquired the majority of the Belo Corporation stock. The company was renamed A.H. Belo Corporation. G.B. Dealey died on February 26, 1946 in Dallas. G.B. Dealey’s successors as chairmen of the board of directors were his widow, Olivia Allen Dealey (1946-1960), son, E.M. (Ted) Dealey (1960-1964), son-in-law, James M. Moroney (1964-1968), grandsons, H. Ben Decherd (1968-1972), Joe M. Dealey (1980-1984), and James M. Moroney Jr. (1984-1986), and great-grandson, Robert W. Decherd (1987-present). Under their leadership, A.H. Belo Corporation became the longest surviving business enterprise in Texas and grew into the additional directions of television broadcasting and online publishing. Starting in the 1960s, the corporation grew by acquiring several newspaper and television businesses. The article by Judith M. Garrett and Michael V. Hazel, A. H. BELO CORPORATION," in the Handbook of Texas Online summarizes the company’s history. 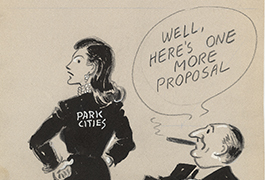 According to the article, “in 1963 Belo purchased seven suburban newspapers, the Arlington Daily News, the Garland Daily News, the Grand Prairie Daily News, the Irving Daily News, the Mid-Cities Daily News, the Richardson Daily News, and the Suburban News, since renamed Metrocrest News, which together form the wholly owned subsidiary DFW Suburban Newspapers, Incorporated. 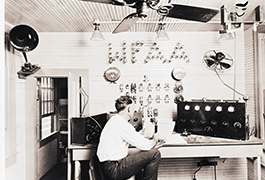 Belo entered the television broadcasting business in 1950 with the acquisition of its principal station WFAA-TV, Channel 8, the ABC affiliate in Dallas. The station had begun broadcasting five months earlier as KBTS-TV. In 1984 Belo purchased four television stations from Dun and Bradstreet: KHOU in Houston; KXTV in Sacramento, California; KOTV in Tulsa, Oklahoma; and WVEC in Hampton-Norfolk, Virginia. In 1994 it purchased WWL in New Orleans, Louisiana. In December 1981 A. H. Belo Corporation became a publicly held entity, with its common stock traded on the New York Stock Exchange. In December 1991 Belo acquired the assets of the Dallas Times Herald.” In 1997, A.H. Belo Corp. acquired The Providence Journal Company, The Press Enterprise (Riverside, CA), and several television stations across the country. In 1999 the Denton Publishing Company, publisher of the Denton Chronicle, was purchased. In 2001, the Belo Corporation changed its name to Belo Corp. In 2008, the broadcasting and print businesses were split into separate properties. A.H. Belo Corporation, covering the print newspaper business, became a publicly-traded company, with Robert W. Decherd as chairman, president and chief Executive Officer. The other property, Belo Corp. currently includes 20 television stations and also operates more than 30 websites under the Interactive Media group. The digital collection contains a small but growing sampling of 24 series within the physical collection. For more information on how the physical collection is arranged, please view the finding aid. 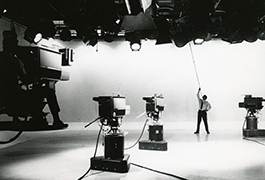 See WFAA news clips from the 1960s and 1970s in the WFAA Newsfilm Collection, ca. 1960-1978.